When staff member Linda first told me about this book, I couldn't help noticing how passionate she was. I believe you will understand why after you read both her review as well as the book itself. And don't forget to click on the youtube link at the end of her post. "After watching an interview with Angie and Todd Smith (Todd is the lead singer of the group Selah), I knew that I needed to read the book I Will Carry You. I needed to be able to understand such grace and faith in the face of such a tragedy. With beautiful honesty, Angie tells their story, of being 18 weeks pregnant, of learning that their beautiful baby girl had conditions leaving her "incompatible with life", and of being strongly advised to terminate the pregnancy. Together they decided to carry baby Audrey as long as God chose to give her life. They spent the next 3 months loving a little girl not expected to draw a breath. Audrey Caroline defied the odds, and lived over two hours, weighing 3 pounds, 2 ounces. She spent her two hours being loved and cuddled by many family members and friends. She was loved, and her life made the world a better place. Angie takes us along on the journey, sharing her incredible faith, but also the very human hurts and struggles they faced. She clearly shares the different stages of grief, but also teaches us how to comfort someone who is hurting - the right things to say, and the things you really shouldn't. This is a beautiful, poignant read. An inspiration and a challenge to all of us. Central Heights Church has the dubious distinction of being the church where the floor collapsed during a Starfield concert almost 2 and 1/2 years ago. It happens to also be the place that I have called my "home church" for the past 34 years. Yesterday was a banner day for us as we celebrated together in the repaired Worship Center for the first time since April 2008. I was not an official "greeter", but I chose to stand at one of the entrances and welcome folks. We have not all been together in one place at one time for so many months that I felt a great longing to re-connect with fellow worshippers and to celebrate with as many people as possible. Handshakes and hugs marked our mutual sense of thanksgiving and joy. Very appropriately, Why We Love the Church by Kevin Deyoung and Ted Kluck has been my current non-fiction favourite for the past few weeks. These are the same two guys that wrote Why We're Not Emergent a couple of years ago. On the back of the book, Josh Harris says, "If you've written off the church, I dare you to read this book." It is a refreshing and well researched answer to the multitude of church bashing books these days. Easy to read. even the footnotes are fascinating. I know that I love Christ's Body, His Bride, but sometimes I can't articulate why. These authors have no difficulties doing so! They have obviously thought long and hard about why the organized institution of "church" is valid, necessary, credible and deserving of loyalty. They site historical and Biblical sources as well as contemporary theologians like John Stott to support their stance that church is NOT just two guys on the golf course or at Starbucks discussing spiritual matters. Their aim is to present a biblical, realistic and Christ-centered doctrine of the church. Let me quote just a bit to give you a taste. "It's more than a little ironic that the same folks who want the church to ditch the phoney, plastic persona and become a haven for broken, imperfect sinners are ready to leave the church when she is broken, imperfect and sinful." The authors also remind us, that contrary to popular belief, the early church was not always a perfect, power-filled, beautific utopia. Every sin and fault-line evident in present day churches were already in the churches that Paul addressed: sexual immorality, hyprocrisy, gossip, factions, heresy and money issues. Deyoung and Kluck are not naive or in denial. They encourage us to face and deal with our faults head-on but they also remind us not to cower under undeserved criticism. I join J. I. Packer in wanting to cheer after I read every word of this excellent and timely treatise on church - mine, yours, ours. Now that I am a grandmother, I understand. Even my theology has shifted. That whole sin nature business was a big question mark until the 2nd birthday. I would explain behavioral glitches as environmental, not organic. But one thing was a given from day one. These children would LOVE TO READ. Other loving relations bought cute furry crib dwellers, flashy rattles or cozy sleepers. This grammy prepared for the imminent arrival by laying in a selection of reading material. As the tummy extended, the stack in my bedroom grew taller. Bible stories, animal alphabets, glossy paged tales, pop-ups, fold-outs, 3 dimensionals and chewables. I could hardly wait until I could prop up that miniscule bit of my flesh and blood in my lap and introduce him or her to books. One of the first that we explored together was recommended by Kim who purchases our children's collection here at House of James. 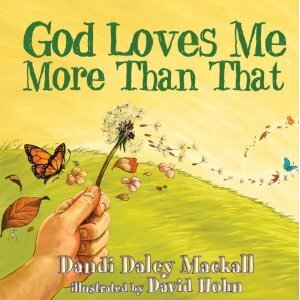 God Loves Me More Than That by Dandi Daley Mackall captivated me immediately. Not too big, not too small, not too thick, not too many words per page, enchantingly illustrated by a genius named David Hohn, it quickly became an oft-requested favourite. Energetic vocabulary enhances the text. Words like “space shuttle” and “sneeze” and “semi-truck” are incorporated so naturally that the reader and the listener are caught up in the cadence before they realize that they are experiencing lyrical poetry. God's love is described and expressed so convincingly that one wants to leap into those welcoming arms. A far cry from the Halloween tract that literally scared me out of hell 53 years ago (and vice versa, albeit short lived). It's never too early or too late to start reading to your little ones. Lock the computer, turn off the dvd, sit down on the couch and let them clamber onto your lap. At lunch today, a colleague and I discussed what we were reading. Rick waxed so eloquent about two new fiction books he had just finished that I immediately asked him to send me reviews for today's post. His comments certainly piqued my interest. "This is a book that combines historical fiction with Biblical history, mixed with a contemporary suspense and romance thriller. That may sound confusing, but it's a fairly straight forward plot, so a serious reader will have no problem keeping everything straight. It also carries a specific theological viewpoint that I found fascinating. It is paced evenly enough so that you are not bogged down in historical detail, nor reeling from the shifts between the first and twenty-first century. I expected to find some aspects of the story that were suspect from a biblical perspective, but Howard steers away from this and gives us the history from a very solid, evangelical perspective. 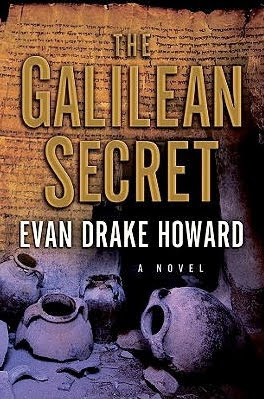 The "secret" is not something that really exists, but if it did, it would only reinforce the power of the New Testament. Over-all - a great read!" "This is a murder mystery novel that is several notches above the average for characterization and plot-line. The main character is a deeply wounded police detective who solves, in his path to redemption, a whole series of inter-related murders. It has a gritty, but very human "feel", accented with an understated humor and a wonderful way of helping you to really live inside the head of the detective. It is not awash with blood and gore, but it does portray a very brutal series of crimes. It was an absorbing book!" Friday morning found me in the waiting room of the eye doctor. Diagnosis? Corneal abrasion. Ugh. And even further ugh was the conclusion that the surface of my eyes is eroding. I shrieked when I heard that ominous word "erode". "Please don't use those two words (eye and erode) in the same sentence!" But my doctor was quite firm. After decades of wearing rigid contact lenses, we needed to make some changes. After my appointment, I charged right back to the store and grabbed a handful of books that I had been meaning to read. If my reading days were numbered, I was going to go down reading! So many good books to read, and so little time! But at least I got to read this one. The Last Christian by David Gregory took only part of this weekend to read and that's because I read faster and faster to find out what on earth was going to happen. Gregory is the author of other books I have often recommended, Dinner with a Perfect Stranger, A Day with a Perfect Stranger and The Next Level. This full length novel is set in 2088 (no longer that distant a future) and features an overseas missionary who comes back to a God-less, Christianity-less America. Artificial intelligence and brain transplants are opening up unlimited possibilities to those willing to pay the price. Neural implants enable virtual reality on every level. Every page, every new scenario made me think deep thoughts! "Is this technology already available? What would I do? Are the characters in the story making the right choices? Does one even have the power to exercise choice in this new world? Would I be able to survive? How would I defend or even define my faith in Jesus Christ? How current is this book?" I felt like I was reading "science reality" not "science fiction" and it hit way too close to home. But I'm so glad that I did read it, because I will never be the same. Yes, it's that profound. You read it too and let's talk about it! Gary loves reading books that challenge him and that make him change the way he thinks. He and his family relish discussions together about the books they are reading. And he loves visiting the House of James bookstore! "My son Aaron (22) read Plan B by Pete Wilson. When I asked him what he thought of it, his response was "Dad, you have to read this book". So I did and I loved it. More than that, it has changed the way I think. We have an idea of what we want or expect our lives to be but when curves balls come (and they always do), we get frustrated, maybe mad at God, paralyzed and wonder what to do. We have a high expectation of being "in control" of our lives but, as Pete says, "the greatest of all illusions is the illusion of control". No matter what the circumstances of our lives are, God is in control and there are often greater purposes at work. Another pre-conceived idea is that we expect "success" if God calls us to a certain venture. If God is in it, success must be guaranteed right? But even if it does not turn out as expected, we can be assured God is still present in our circumstances and it's best to take a long term view. Maybe as long as an eternal view. One example from my life. I had worked for three employers in a row over 25 years who all went out of business (it was not my fault really :)) and have wondered why I had to endure it three times. With the last two employers, I really felt God leading me to work there. But as I look back, the lessons learned have been priceless. As I write this, I realize this could sound like a cliché but the light bulb finally went on in a way that has caused me to realize that some of my typical responses were flawed. I like the way Pete Wilson used big sections of biblical characters' lives as illustrations. Joseph, David, Job to name a few. Applications are made in the context of the story and are right on the mark. In summary, this book has helped me think about the circumstances of my life in a whole new way. Before, I thought about the disappointments (plan B's) of life as ... negative. Now I would consider them as part God's plan, training and greater good even if I cannot see it or it hurts. When a book changes the way you think (which means it will change the way you live), you know it was worth reading. I would recommend it to absolutely anyone. 5/5 stars." I am innately distrustful of advancements in technology. I used a typewriter long after my husband & colleagues were embracing DOS in the mid-80's. When Powerpoint arrived I wanted to chain myself to the slide projector that I used to show the worship songs on Sunday mornings. But even I got annoyed with my inability to correct spelling errors. The only reason I reluctantly learned how to email was because my husband traveled overseas for several weeks in '96. If I wanted to communicate with him it had to be via Outlook. Several years ago, in a small, passive sort of protest against blogging, I wrote an “Unblog” (aka family newsletter) via email to huge acclaim and affirmation. A small shaft of light began to shine into my Luddite brain. Facebook was a big time-waster in my considered opinion until my friend introduced me to “creeping” which apparently is what mothers do to keep track of their off-spring and their off-springs' friends. Bingo. Now I even have my own Facebook friends. As I was driving home from work a few days ago, I heard a chilling news item on my favorite radio station. Britain's spy agency MI5 was retiring (read firing) its older agents who had refused to embrace modern networking technology. Jolted is too mild to describe the sensation that went down my spine. Therefore, I have now become a firm believer (okay a flabby believer) in communication by machine, more familiarly known as the social media. Playing with a friend's i-phone yesterday actually activated some sort of long suppressed urge to buy my own. You can sit in your rocker and check Facebook or tomorrow's weather with a small purple gadget the size of a pack of cigarettes. Loving books and people as I do, and wanting to connect the two, it is a pleasure to introduce the House of James Book Talk blog. Want to know what we are reading? Loving? Recommending? Hating? Want to contribute YOUR thoughts? Wish there was a way you could ask our children's book manager what she would recommend for children who have experienced tragedy? Do you have questions about the multitude of Bible translations? Wondering what “Christian” fiction looks like these days? Hoping to interact with other bibliophiles? We hope you will join us semi-weekly as we explore the wonderful world of books and related products using this electronic tool. We would love to see you at our bricks and mortar store, of course, but I hope that your appetite will be whetted by this blog. And of course, we welcome your comments.